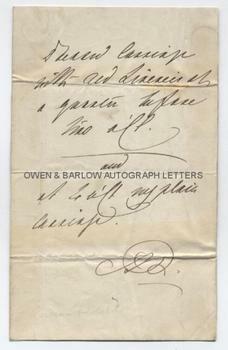 QUEEN ADELAIDE Autograph Note Signed. Princess Adelaide of Saxe-Meiningen. Queen Consort of the United Kingdom and Hanover and spouse of William IV. The city of Adelaide in Australia was named after her. 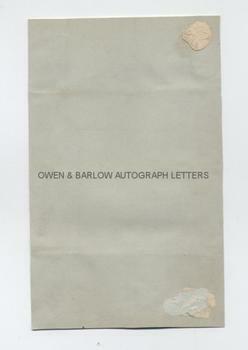 Autograph LETTER (Note) Signed. [No place, no date]. A brief letter to an aide or orderly, to be delivered by hand. Signed with initials. "I want carriage with all liveries at a quarter before two aft[ernoon] and 4 aft[ernoon] my plain carriage." 8vo. Approx 7 x 4.5 inches. Some creasing and slight browning. Laid down on thin card with mounting traces on verso. Good. Queen Adelaide was the daughter of the liberal German ruler, George I of Saxe-Meiningen. By 1811 George III was mad and the Prince Regent was estranged from his wife and with no prospect of having legitimate children. William, like the other Royal Princes was therefore expected to quickly find a wife in order to secure the male line. William already had 10 illigitimate children by the actress, Dorothea Jordan, but was pressed to find a suitable spouse. Eventually Adelaide, who was prepared to accept William's illigitimate offspring as part of the household, was selected as the ideal candidate. They married a mere week after first meeting. William wrote "she is doomed, poor dear innocent young creature, to be my wife".